Publishing post-Brexit, an emphasis on the importance of intellectual property, and the role of publishers in education were the key issues that incoming Publishers Association (PA) president Peter Phillips expected to pursue during his tenure, he told the PA AGM at the Science Gallery in London yesterday. 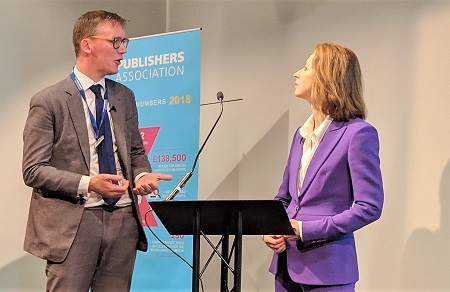 The event marked the moment at which Phillips, CEO of Cambridge University Press, took over as PA president from HarperCollins CEO Charlie Redmayne. Copyright had ensured Britain's position as a world leader in the "quality, accuracy and authenticity" of its publishing, Phillips said. The industry's products were "a great source of wellbeing in our society". Publishing was also vital in education - "all publishing is educational in one way or another". The PA would engage in further research to demonstrate the role publishers played in promoting "an educated, informed and literate society". Phillips touched on the need to counter negative coverage of academic publishers' contribution to education and research. The PA would focus on emphasising "the importance of investement in content - which is not the antithesis of 'free'". Britain was a pioneer in open access publishing, he said. Stephen Lotinga, PA CEO, outlined some highlights of the association's activities during 2018, when it built its membership to 132 - a record. They included lobbying over EU copyright legislation, challenging the behaviour of Amazon and other big tech companies, many meetings with UK politicians, developing the association's social media presence, demonstrating the value of publishing amid the creative industries sector, and launching a campaign against VAT on e-publications. Lotinga thanked Redmayne, saying: "You have empowered the PA to be bold, ambitious, and proactive." The keynote speaker was Dame Helena Morrissey, financier, found of the 30% Club, and author (for HarperCollins) of A Good Time To Be a Girl. 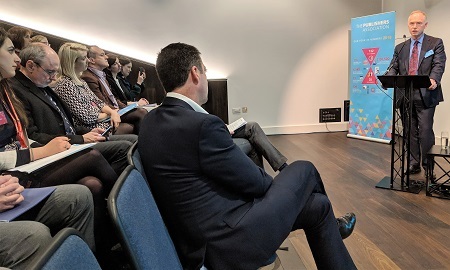 Promotion of diversity had to permeate an organisation, she said - a message that, to be fair, the big three UK publishers appear to have recognised. (On gender, Redmayne noted while asking a question that 66% of HC's staff were women, and that the split at director level was 50/50). Get involved and become mentors, she advised senior managers; don't recruit with an eye to quotas, but recognising that a healthy company needs diverse skills. "It's not about political correctness," she said. "It should be about results." After stepping down as president, Redmayne remains on the PA council. Annie Callanan, CEO of Taylor & Francis, was elected vice president and treasurer, and will succeed Phillips as president next year. Andrew Franklin of Profile, Kathleen Farrar of Bloomsbury, and Anne Kitson of Elsevier were appointed to the council to serve their first three-year terms. Emma Bourne of Springer Nature was re-appointed to serve a second term. The PA launched an associate membership offer at the event.